Gastrointestinal (GI) health is directly affected by factors, such as exposure to microbes, poor diet and a stressful lifestyle, that can negatively impact immune function. The prevalence of refined sugars and carbohydrates and the low presence of fiber in the Western diet has been directly linked to the alteration of the colonic environment. Since the body’s immune system is a complex and dynamic defense system, healthy microbial balance and antioxidant support help ensure more optimal immune function. Maintaining healthy microbial balance is not only integral to optimal GI health, but also supports overall health and well-being. Paracid Forte provides a blend of plant compounds which work together to defend against microbial stressors. Formulated with the goal of supporting the GI flora by promoting balanced immunity, the plant compounds in Paracid Forte also provide potent antioxidant support to help fend off microbial challenges. The ingredients in Paracid Forte help to maintain a healthy GI environment by supplying botanicals shown to create a hostile environment for pathogenic microbes. 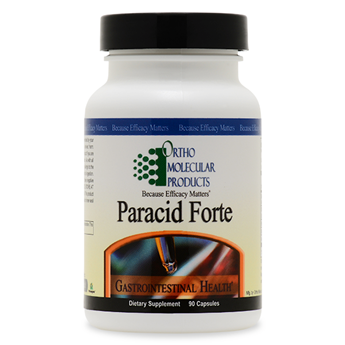 Each capsule of Paracid Forte includes sweet wormwood (150 mg), olive leaf extract (100 mg), black walnut hulls (85 mg), and artemisinin (25 mg) for comprehensive support of the GI tract.